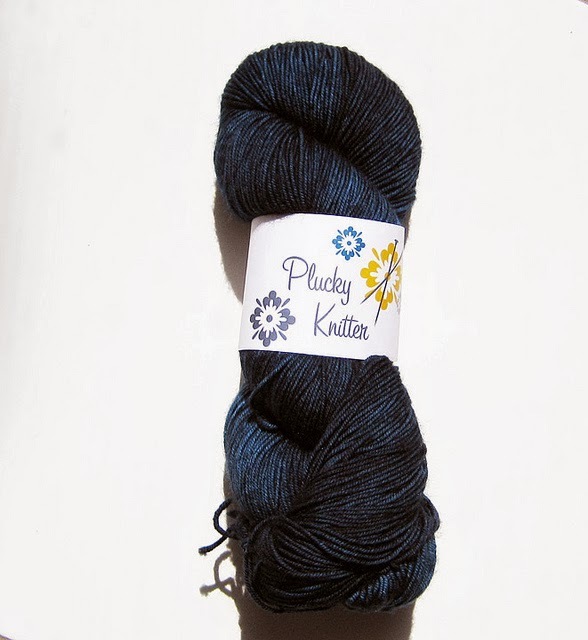 While I don't knit socks very often (there are so many more epic things to make! 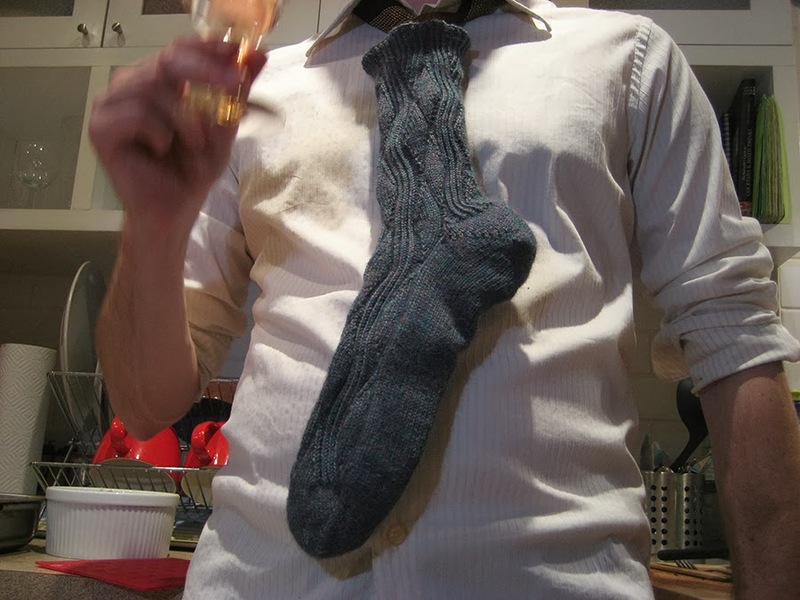 ), I do wear knitted socks all the time at home. Exclusively, actually. I basically wear a pair out to the very threads and cast-on once I hear the death rattles in their throats... uh... heels. 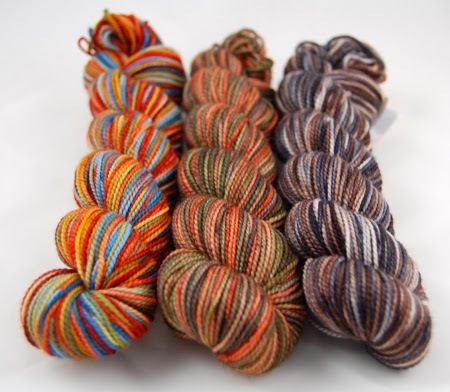 This is an interesting M.O., as you learn pretty quickly how good a sock yarn is by the length of time between new pairs. 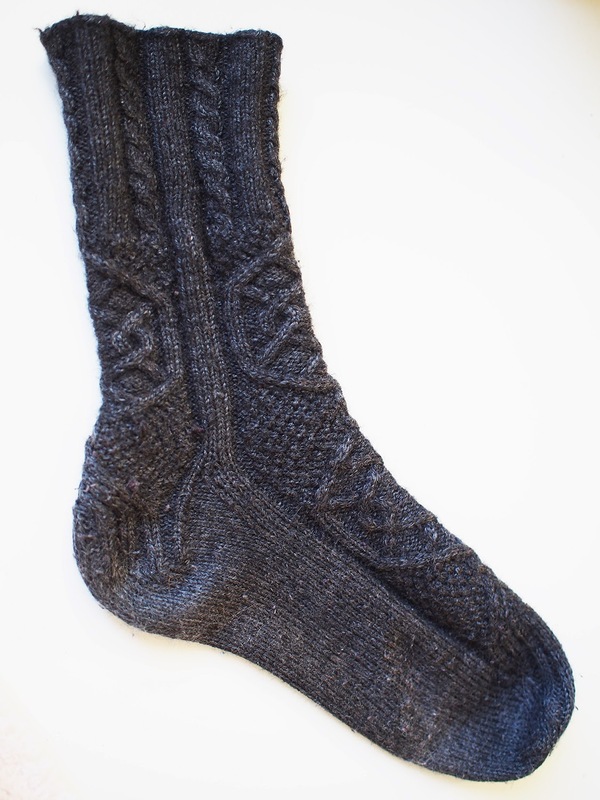 My first pair of socks were Cascade Fixation (98% cotton, 2% elastic) and died in a few months. I was shocked. 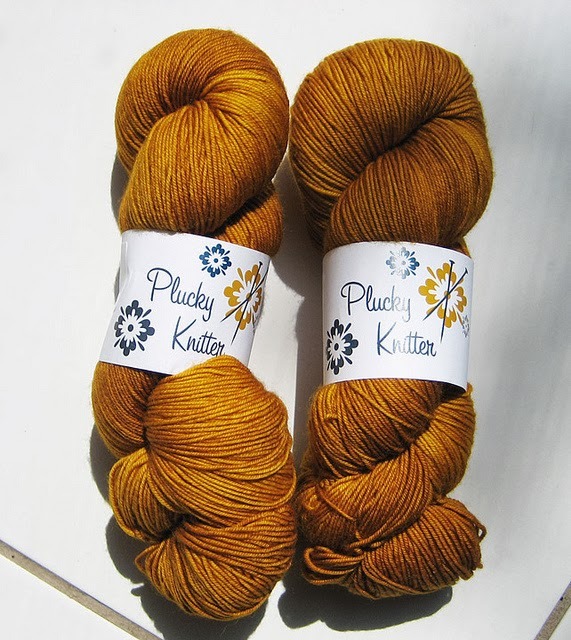 The second lasted only a bit longer - Koigu PPPM (100% merino). Yeah, I learned my lesson: DON'T BUY SOCK YARN WITHOUT SYNTHETICS. According to Ravelry, my third pair has lasted since November of 2009 and they are only just starting to thin at the ball of the foot. 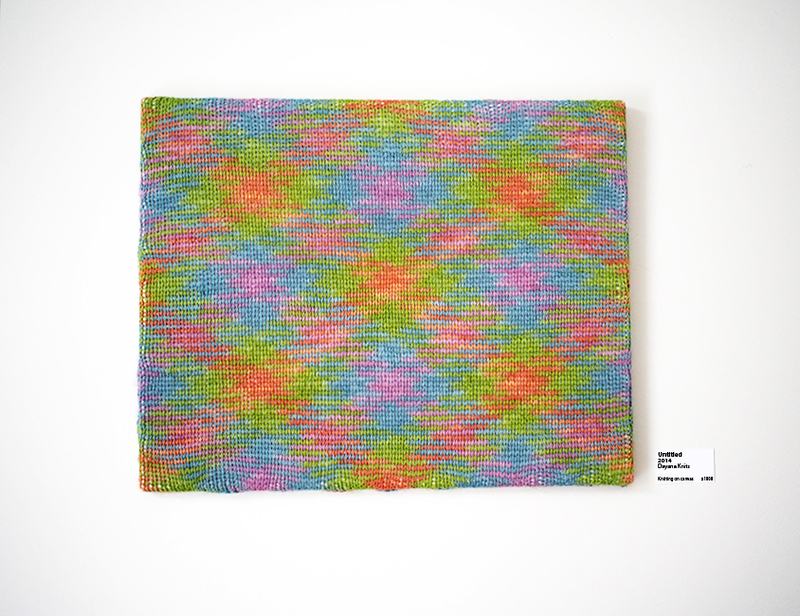 They were made with Phildar Preface (70% wool, 30% nylon), so you can understand the trend! 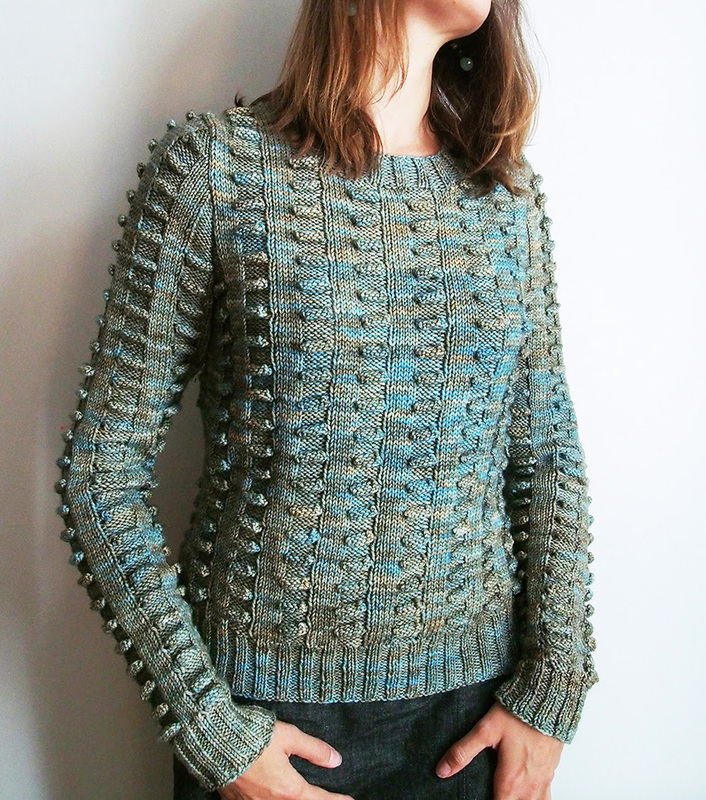 This is the free pattern Hourglass by Bev Elicerio from Knitty 2008. 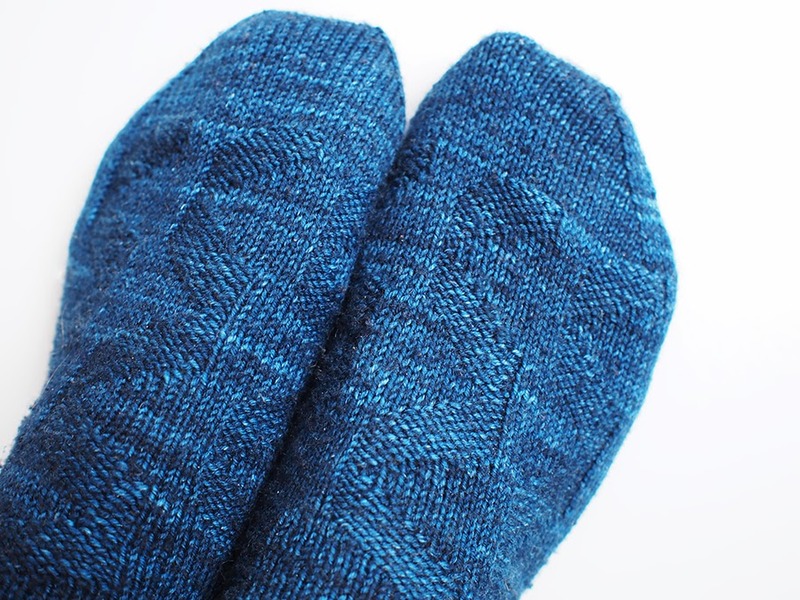 My fourth pair was an interim test knit and didn't really fit the 'wait-until-the-end trend'. 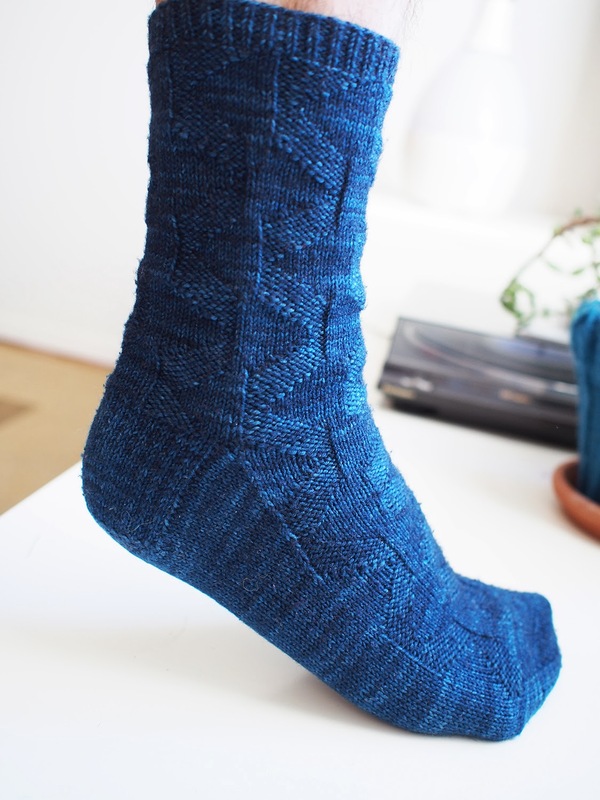 I just loved Claire Ellen's Tolkien-inspired sock collection (there are tons! ), and this one was Eomer. This brings me to B. 's first pair of Man Socks, which I unfortunately made with Socrates. 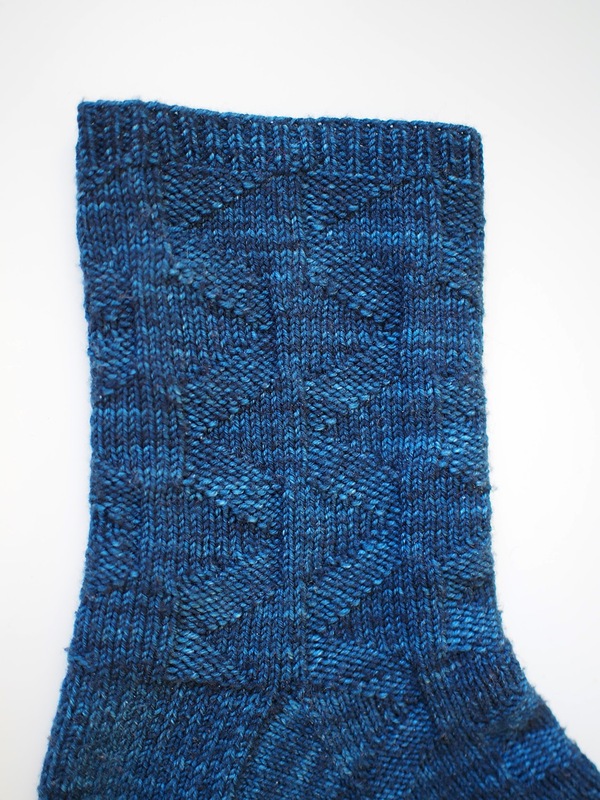 The pattern was awesome and already sized for men, Unicurves by Jeannie Cartmel. Ah, New Year's 2010 to 2011. That's my B., he should have been cast in Madmen. Well, the end is near for his pair, so it was time. 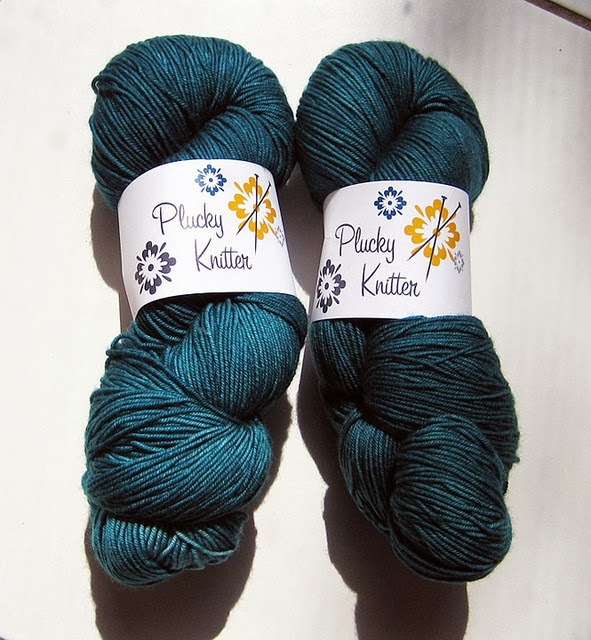 About a year ago I came across The Plucky Knitter for the first time and promptly fell in love with Plucky Feet. I bought 3 luscious colors and saved one for B. ...which of course were only sized for a medium woman's foot. Sigh. You know what? If the pattern had a men's size, these would have been done a year ago! I tried two-at-a-time socks on magic loop for the first time. 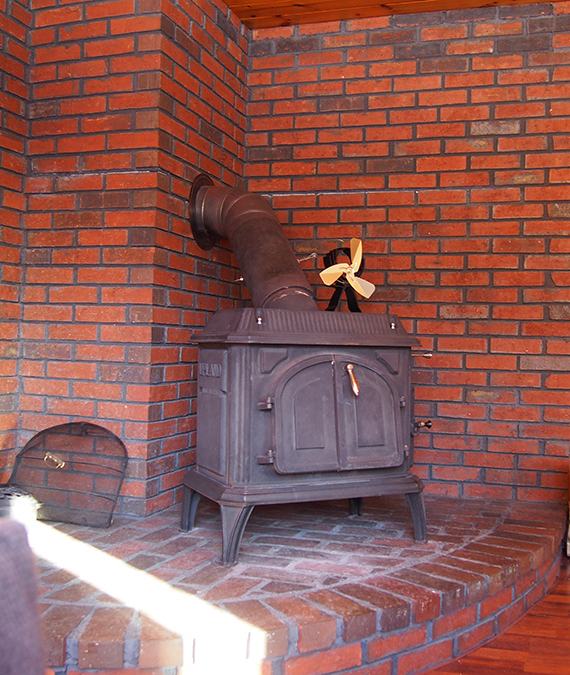 One more thing off my knitting bucket list! 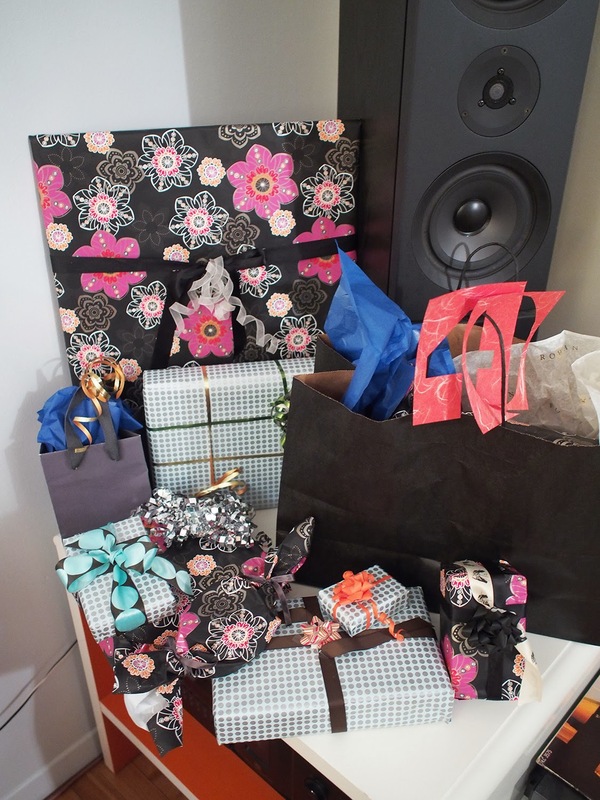 I used this rather flowery blog post for guidance. The only real challenge is the cast-on, the rest is really like magic loop. I did get annoyed at all the stitches at the heel at some point and ended up moving to just one sock at a time. Frogging back to a dropped stitch and a blatant pattern mistake might have helped that move! 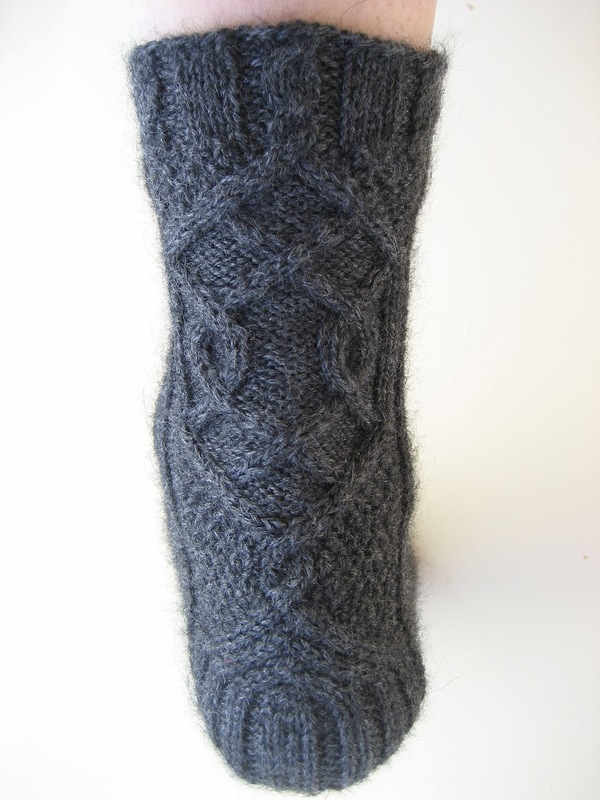 It actually wasn't hard to adapt the pattern at all, unlike many sock patterns. 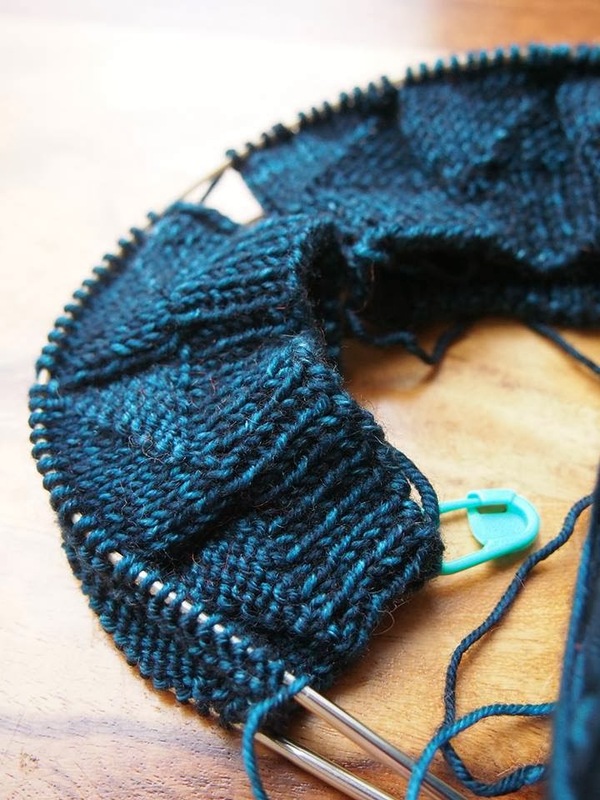 Simply add purl stitches between the zig-zag motifs. There is one naturally, and I increased to 3 between (72 sts). 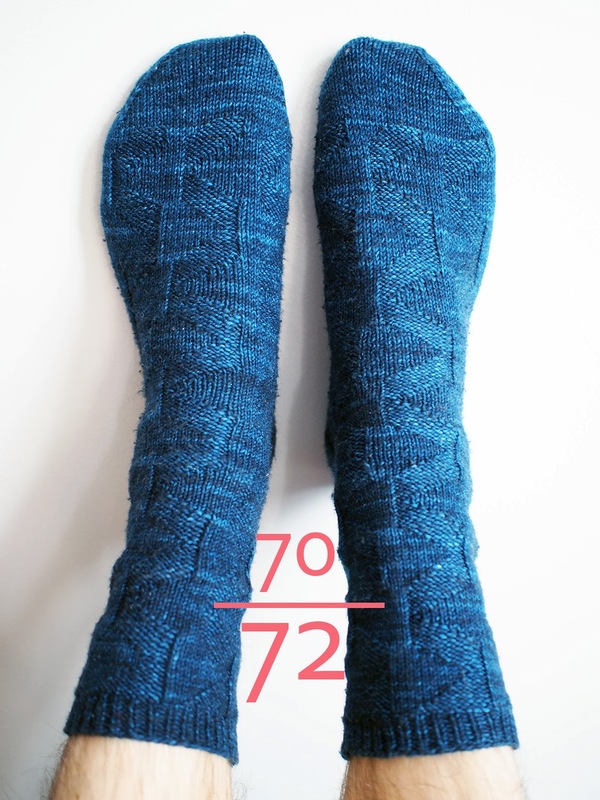 But it was a very stretchy pattern and I reduced to 2 purls at each side of the foot about 2.5 inches down the cuff, making it a total 70 st sock. It fits perfectly. For you to compare (and for me to remember! ): Leg, 23 cm; upper ankle, 21.5 cm; lower ankle, 25.5 cm; below ankle to foot, 25 cm; widest foot, 24 cm; base of toes, 22 cm. 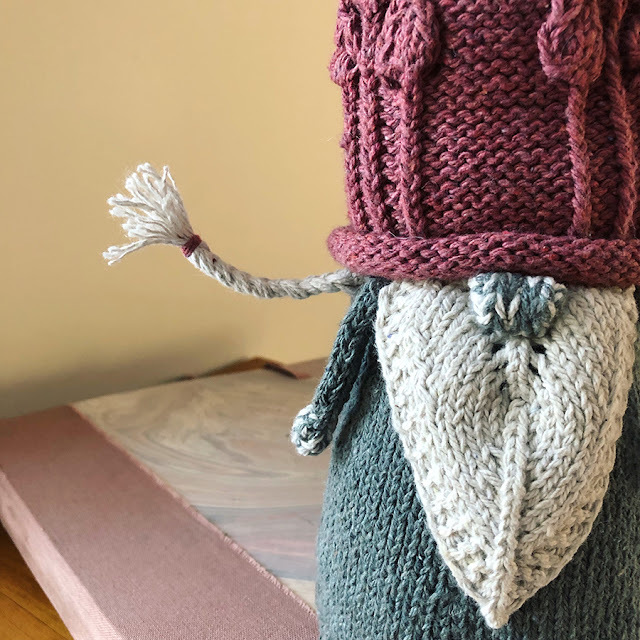 What it took to actually make them was his 40th birthday coming in December, and because I had been so lazy, despite him knowing the yarn and the pattern, it turned out to be the biggest surprise! As far as I can tell, he has worn them almost every day since December 10, and even brought them on his trip to New Orleans for lounging around the hotel room! 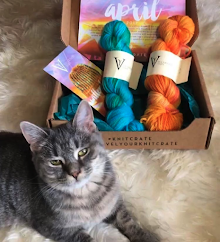 The yarn is fabulous. 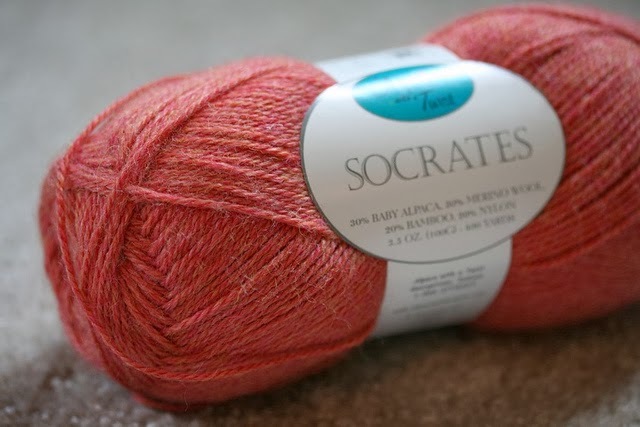 Sturdy and not too soft (indicating a weak yarn, in my opinion), but not scratchy in the least. They do stretch after some time of wear, but it is in the normal time. The nylon content is only 10%, so I am very curious about how long they will last. I'll update you! I have to ask - do you hand wash all these beautiful socks or with the nylon content, can you throw them in the washing machine at a cooler temperature. It's the prospect of handwashing (or the socks getting into the washer by mistake) that has stopped me from ever attempting to knit socks although these patterns really look wonderful. I throw everything in the washer, no matter what the ball band says! They usually get nice and tight, and then block out within a few hours to snuggle your foot. 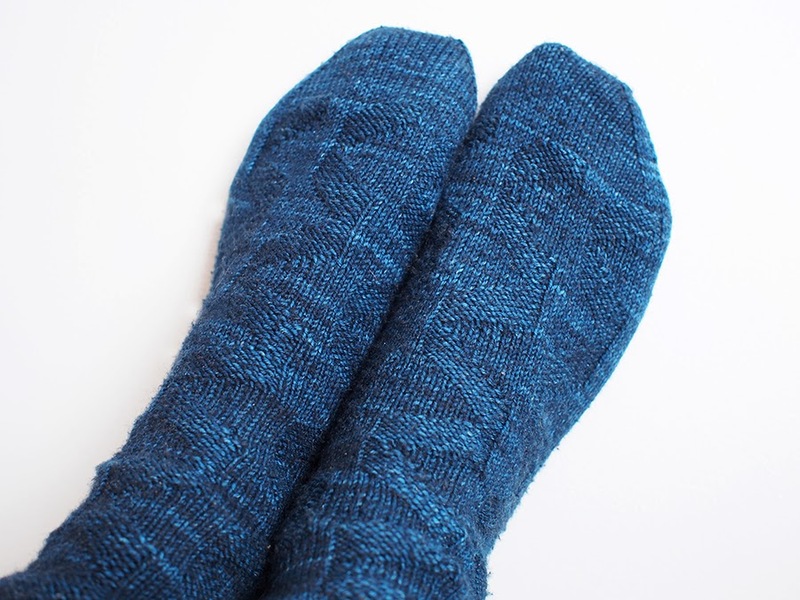 I looooove how knitted socks feel, but if I had to handwash them I wouldn't make them either! Good to know - thanks! Also good to know that they don't felt - I guess the nylon helps with that. I may give it a try this year after all. Merino/Nylon, seems appropriate here !!! Definitely try with some nylon. 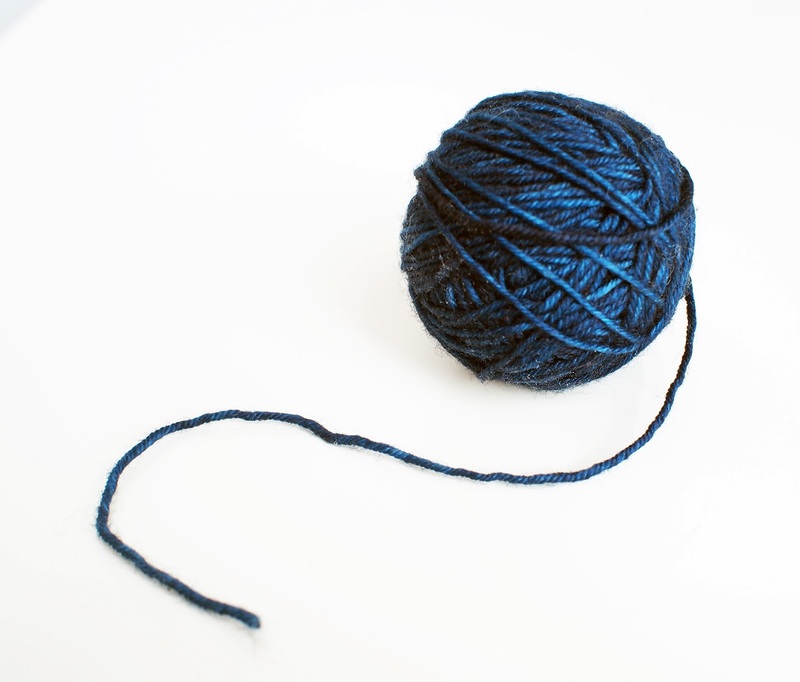 Or, hold a nylon thread along with the merino while you knit the heels and toes! OMG! 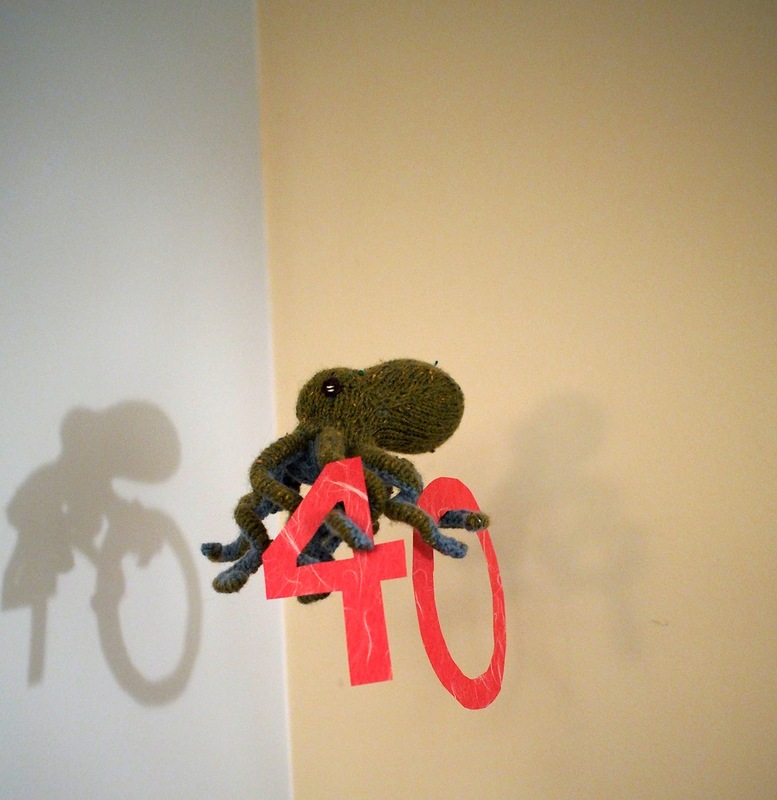 The knitted octopus with the 40 sign is sheer genius! What a lucky man your husband is, to get these amazing socks and such a creative and inspired celebration to boot. 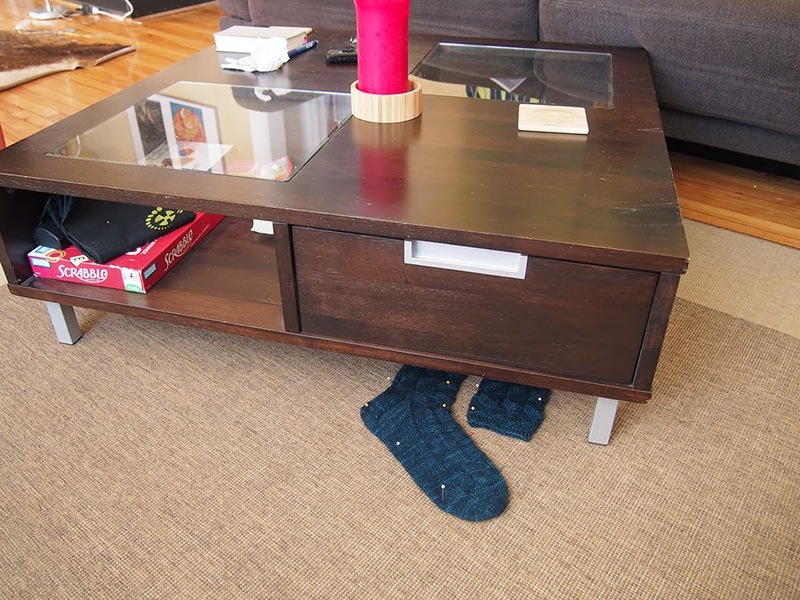 No wonder he has been wearing those socks constantly! 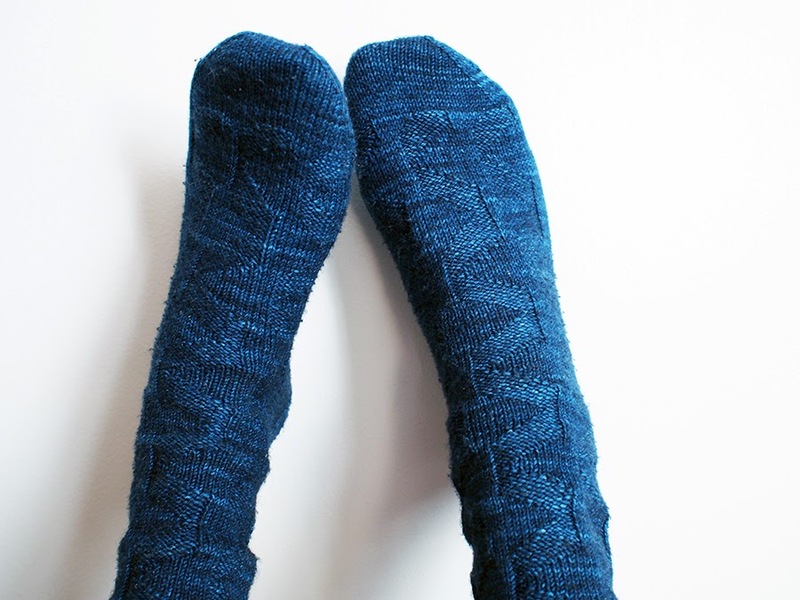 Love your hourglass socks too, those are fabulous! The designs of all these socks are very cute.I have been very much attracted by the red colored socks. 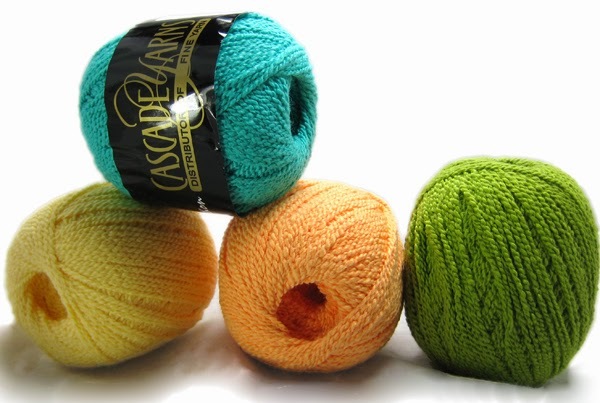 I am very excited to make that type of socks but in green color because green is my favorite. The designs of all these hand knitted socks are really very charming. 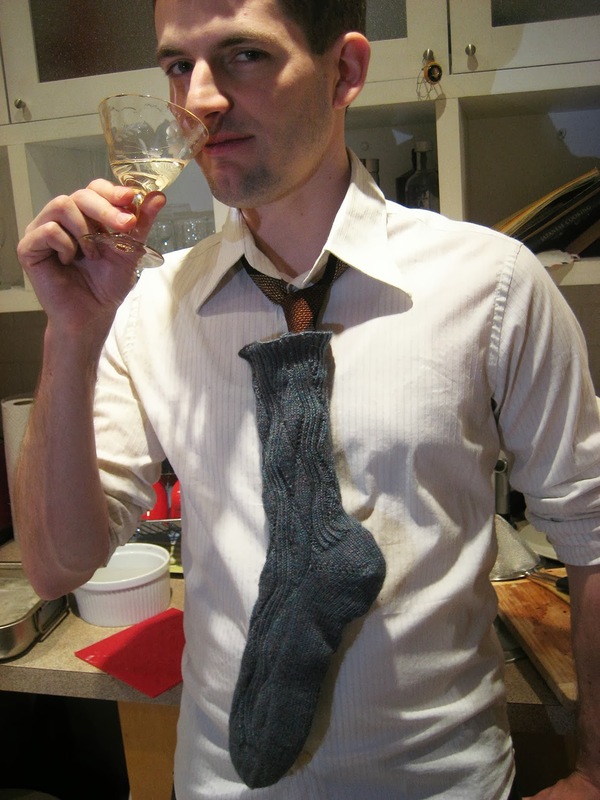 I am also a sock knitter but I never tried such type of designs. Now I will definitely knit some pairs of socks with these designs.